As the law of Cape Verde requires couples to be in Cape Verde for at least 30 days before they can legally marry, we will not be offering the service for legalised marriages in Cape Verde. If the law changes in favour of visiting tourists, we will obviously reconsider. However we are able to offer other services. 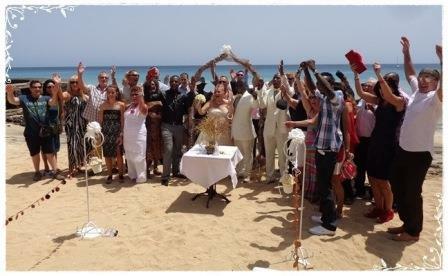 The easiest option for non-residents of Cape Verde is to have their marriage notarised and legalised in their own country then come to Cape Verde to have a Religious Marriage Blessing arranged by us with the Evangelical Church on the island of Sal. The marriage blessing can take place on the beach, near a beach venue, in a restaurant and at some hotels or in the Evangelical Church. You can also decide to use a Layperson to perform the ceremony if you prefer. "I know this is long overdue but I figured much better late than never. I just wanted to officially thank you wholeheartedly for all your help with the wedding blessing. Victoria and I could not have been happier with either the location chosen, or the preparations or more importantly your pleasant happy manner in dealing with us. I know we told you at the time but you can’t tell someone too many times ‘great job’. We speak from experience when we say you are the absolute best. Thank you for making our most memorable of days the absolute best ever." 13-Dec-2018 07:50 AM Myra, Chris Morgan . My self and my husband went to cape verde Nov 2018 and had Cheryl orgernise a renewal of our vowels after 26 years Cheryl was really helfull and showed us around and even organised a trip for us could not of asked for more . These Religious Blessings or a Renewal of Vows ceremony are performed by a Pastor of the Evangelical Church. The Church requires you to provide legal proof of being single, divorced, of age or documents to prove you are still legally married etc. The legal documents and information will need to be sent to us prior to arrival on the island so they can be checked and translated if required. A ceremony certificate will be issued by the Evangelical Church for the couple and their witnesses to sign at the end of the ceremony. As this is a blessing or renewal of vows, we can provide any of the following. They are read by a Pastor in Portuguese and then the translator reads them in English. 1. Some couples use the Marriage Vows when they are Renewing their Vows (see secure zone web page). 2. Some use ammended marriage vows by adding some references in there about what has happened since they first said their vows to each other. 3. Others write their own vows and include some history about how they met, their new family, good times, difficulties shared and over come, hopes for the future etc. 5. Some include a 'Ceremony of the Sands' service, where two individual vessels, representing each of you, have sand poured out of them into one bottle, representing you as a couple. 6. Some use a mix of any of the above. We want you to choose what you require, every couple is different so we try and be as flexible as we can to try and meet each couple's needs. - Documental evidence from your Registry Office proving that you are both single (divorced/widowed). - Or Marriage certificate/document if renewing your vows. When a Pastor performs the service, they are usually carried out in Portuguese so in most cases you would need a translator which we would arrange. If you don't require a Pastor to perform the service then we can provide a Layperson to perform the service in English. - We provide these services for those who still prefer a service similar to that provided by the Church, or they can be something slightly different, it can be formal or informal. - Those that have just got married, been married for several years or want to celebrate their 25th Wedding Anniversary may want to consider these. We will discuss with you how you wish to have the service delivered, what you want read to you or you to each other. Our services are performed in English, but we have had couples who have read their own special words to each other during the ceremony in other languages in addition to the English readings. We can provide these services as for (A),(B) or (C) below. The ceremonies can be small and simple (A), or you may choose to have additional services. A designated vehicle if required for the wedding couple (usually a taxi). Translation - to translate documents for the Pastor and to translate at the service. We organise the service and liaise with other service providers, therefor our organisational time will need to be taken into consideration when we are discussing additional requirements and costs. We will also need to take into consideration time and labour if required to provide larger ceremonies requiring other furniture on the beach, any other bookings made for refreshments etc. NOTE: We are updating our information on weddings on a regular basis. Please re-visit our wedding pages. Comment - What was your 'Cape Verde Tips' ceremony like? How would you rate the Cape Verde Tips services?